Chocolate Lovers, This Is for You. To view this email as a web page, please click here. Please add Corner Bakery Cafe (ecafe@cornerbakerycafe.com) to your email address book. Smile. This Whole Email Is About Chocolate. 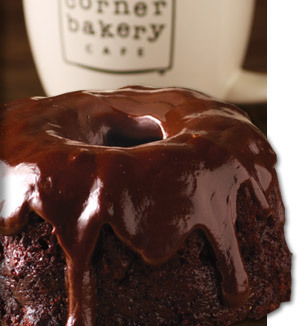 Find bliss in our Double Chocolate Baby Bundt – a freshly baked, moist chocolate cake drizzled with a rich, chocolate glaze. Then toast to your love of chocolate with our Truffle Hot Chocolate – steamed milk blended with chocolate truffle sauce and topped with whipped cream. For the love of chocolate – stop by today.